Situated at the corner of Yliopistonkatu and Kluuvikatu, the Sokos Hotel Helsinki places its guests right in the heart of Helsinki’s shopping center. This convenient location places the property just a few short steps from Senate Square, the Esplanade, and all of the city center’s amenities. The train station can easily be reached on foot from the Sokos Hotel Helsinki. 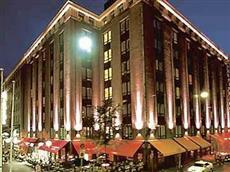 The Sokos Hotel Helsinki is comprised of 202 en suite bedrooms, including 5 suites. All of the guestrooms are pleasant, cozy, and equipped with a number of modern amenities such as a mini-bar, radio, remote control, cable TV, hairdryer, and trouser press. Delicious and healthy international cuisine can be savored in the relaxing atmosphere of the Sokos Hotel Helsinki’s on-site restaurant and the bar provides the perfect place to relax with a fine drink after a long day. Business travelers can make use of the hotel’s conference facilities, should they wish to hold a meeting during their stay. During times of leisure, guests can socialize with friends in the lobby or enjoy a relaxing treatment at the sauna.